This is a very grim percentage fact about the current state of the world's overall health. 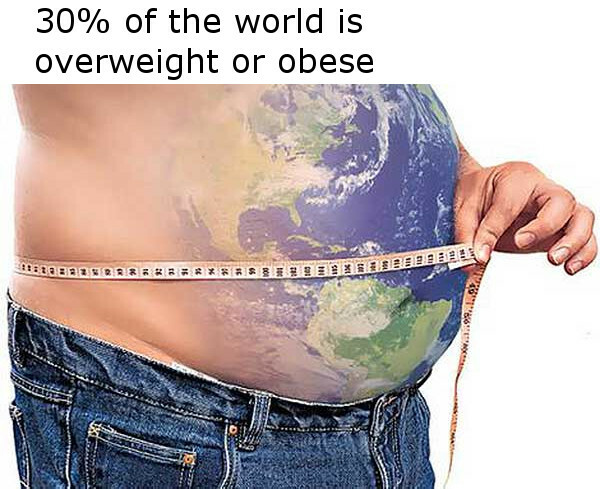 30% of the world's population is either overweight or obese. This marks the first time in world history where there are more people unhealthly overweight than people in absolute poverty. The rise in obesity is attributed to the ease and affordability at which companies can ship processed, high calorie, foods to anywhere in the world. The best way to combat this epidemic is to research exactly what you are eating, as well as those around you, and limit the amount of processed food, especially high sugary drinks, such as coke and pepsi. If we all keep this statistic in mind, we can then think about how to get the people in the world out of poverty because clearly there is more than enough food to feed the whole world.